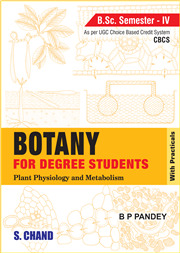 This textbook has been designed to meet the needs of BSc Fourth Semester students of Botany as per the UGC Choice Based Credit System (CBCS). It acquaints the students with plant-water relations and throws light on mineral nutrition. It also covers translocation in phloem, photosynthesis, respiration and enzymes. In addition to these, the book also deals with the nitrogen and lipid metabolism, plant growth regulators and plant response to light and temperature. While it provides strong conceptual understanding of the subject, it also helps in developing scientific outlook of the student.